The end of the Bronze Age heralded an abrupt end to almost two million years of mandkind's reliance on natural materials such as stone and bone, and our ancestors totally lost touch with many skills that had been essential for their survival up to that point. Where has all the instinctive knowledge gone, or has it? Is the human brain at birth a totally blank screen? Was two million years of upright posture and tool making too short a period to have generated some instinctive understanding of how to work stone? What engine lurks within a few modern people and powers them with an urge to make flint handaxes, scrapers, blades and many other tool types that date back to the long past stone age era, and why do they persist in practicing these redundant skills, when the true function of many surviving artefacts will never be more than speculation? Will anyone ever declare that they have gained a degree of competence concerning this ancient craft? This cascade of questions flows easily and could be added to, but direct answers will surely melt into discussion that will provide very little real enlightenment. The suggestion that all modern stone bashers are round the twist is often heard, not only when observed by people who have little interest in the subject, but also by many who share the concern that unnecessary debitage may eventually foul future archaeology. 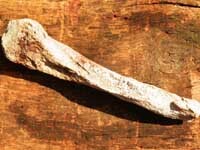 But flint knappers are on the increase, thanks to a flurry of interest in antiquity aided by an endless supply of T.V. documentaries, and by improvements within some departments of education. Information regarding many aspects of prehistoric technology is once again being shared! Small girls up to the age of six, rarely ask demonstrating flint knappers what they are doing. Arguably, small girls up to the age of six rarely meet flint knappers at all, but when they do, they may frequently be overheard giving their mothers, or teachers, an accurate interpretation of what is happening. If given the chance to do some knapping themselves, these small girls will often demonstrate their ability to invent techniques that enable them to deal with the raw material more effectively than the ways that they have just been shown, and in addition, they will continue to work with a surprising degree of precision. Most small boys are not affected in this way. If they have an interest in the subject at all, then it is usually coupled with limited ability, and their self-frustration can lead to some dangerous antics. Beyond the age of six, any patterns regarding the knapping abilities of youngsters, male or female, becomes rare and random. From six years onwards, these small heads are bombarded with information attuned to living in a modern society, and any primitive technological instincts soon disappear. Such observations should interest professors of the mind, for flint workshops with young children are rare and are likely to become rarer, and so this early quality of female understanding could easily go unnoticed. It is not beyond the realms of possibility that our female ancestors manufactured a good many, if not most, flint and stone artefacts, and no apologies are offered here for the suggestion that what is now a seemingly macho pastime, may perhaps be derived from a feminine one! Strength is not the criteria when knapping flints! Patience, precision and a sound knowledge of the way that the material will respond to pressure are the essentials things to know, and patience is the only attribute that will not demand hundreds of hours of practice. So where does a gravel pit at Lynford feature in all of this? The link between the previous paragraphs and Lynford is simply, flint! Millions of tonnes of gravel was laid directly onto the chalk during the culminations of two separate cold periods during the last ice age where it now forms a low river terrace of the river Wissey. Flint and sand are the most abundant materials among these deposits, and measure up to twelve metres thick in some areas. The recent extraction of these gravels began at Lynford during the 1950’s, where the gravel grading plant rumbled on intermittently; separating sands from a variety of graded pebbles and the surplus, reject stone. Rejects, the rocks that are too large to penetrate the more commercial grading screens, were piled up to await the travelling crusher or the need to fill a large hole somewhere in the county. Modern flint knappers have visited the pit during the past forty-five years, and have sampled the finest quality flint on the planet. At times the reject pile became a mountainous stack of flint nodules, sandstone and quartzite, and parasitic knappers were allowed to clamber all over it, where they learned a great deal about the selection of suitable raw materials. 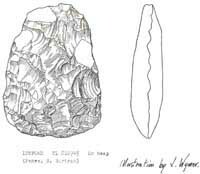 These modern knappers were unaware that their ancient ancestors had been sifting through this very material maybe 50,000 – 65,000 years before them, until in 1982, a genuine and superbly crafted handaxe was discovered laying at the base of a reject heap. Today’s knappers have an unusual look about the eyes! Hunting amongst vast spreads of gravel requires that the hunter’s eyeballs be set far apart like those of a chameleon. This gaze is essential for spotting good raw material, but the scavengers, newly faced with the additional task of searching for artefacts in a quarry, frequently have to switch from the panoramic scanning mode, to one of zooming in and pinpointing small areas of interest. 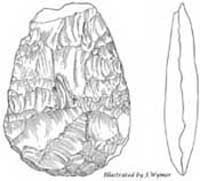 Figure 1: Handaxe found by Phil Harding. Subsequent years of foraging from the original (Pit A) excavation, has yielded over fifty flint artefacts, including seven handaxes and seven flake cores. Some of the faunal samples from (Pit A) featured mammoth, woolly rhino and reindeer, but most of these fell into the hands of private collectors. Not much! You may say, from the hundreds of thousands of tonnes of gravel that has been dug, but just imagine what may have been destroyed or missed over the past few years. Figure 2: Handaxe found by the author. 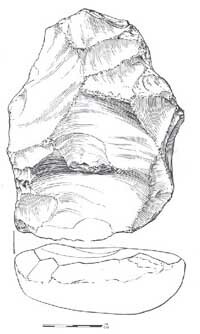 Figure 3: Handaxe found by Bernie Bartrum. Figure 4: Handaxe found by the author. 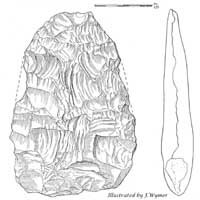 Figure 5: Handaxe found by the author. 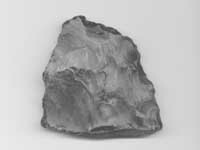 Figure 6: Handaxe found by Val Lord. 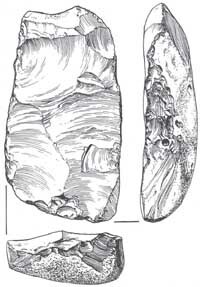 Figure 7: Handaxe found by Val Lord. Due to the close proximity of the river Wissey, the water level of the original gravel excavation (Pit A), had to be constantly lowered by a pumping operation, and even so, the bulk of the gravels were hauled up from below the level of the water table with the aid of a dragline. Due to the gravel being in excess of thirty feet deep in places, the bottom of (Pit A), with the exception of one chalk pinnacle, was never exposed. 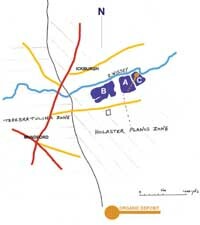 It followed that submerged sections of the quarry edges could not be examined, and the remaining exposed areas offered no obvious indication to the location of artefacts. As the collection grew, it became clear that most of the tools had been made from the finest quality flint that Lynford had to offer, and this made the present day search for artefacts a degree easier, for modern eyes soon became conditioned to recognise the distinctive patina displayed on the ancient fractures of Lynford’s superior flint. The much studied, Brandon series flint, which can still be seen in situ’ today at Grimes Graves, shares similarities in appearances with the high quality flint at Lynford, and in order to establish whether these similarities had any grounding, in 1984, the British Museum conducted an atomic absorption spectrophotometry trace analysis on a substantial sample of the Lynford artefacts, and the results were very convincing. 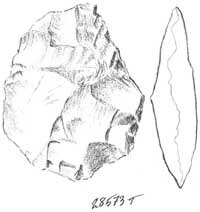 The Lynford finds matched comparably with the chemical composition of the Brandon series flint. It would appear that our ancestors had been using flint from the surrounding chalk exposures, as well as selecting the best from local material that had survived being transported short distances during an earlier phase of glaciation. Figure 8: Illustrated by J Wymer. Figure 8: Flake core found from (Pit A) rejects, by the author. Gravel ceased to be extracted from (pit A) in 1985, and the water table was allowed to revert to it's normal level. During an examination of a man made channel, which was dug in order to conduct water from the forthcoming westerly (Pit B) back into (Pit A), an area close to the river Wissey and just below the flood plain deposits, revealed a quantity of beautifully struck blades and cores. These items were suspected to date back to Upper Palaeolithic times, and the area would have received much more scrutiny had the channel not have been suddenly flooded by the fresh pumping operation. For the next twelve years the clatter of excavation continued from (Pit B), and the site and reject heaps were frequently examined by various individuals until the digging ceased in 1997. Not one artefact was recorded from (Pit B)! The quality of the sand and gravel excavated from (Pit B) changed noticeably as quarrying moved westward.The stone became smaller; less concentrated, and had been dealt more thermal damage than anything previously seen at Lynford. Even the sands faded from being golden and iron laden, to almost the colour of soil. The years 1997 to 2000 saw a period of total inactivity save for a change to the management. Applications were made for quarrying to be resumed in an easterly direction this time, and still to hug the course of the river Wissey. The new management agreed that the eastern area should undergo archaeological evaluation, in order to establish whether the surface layers were concealing material from the Mesolithic (Middle stone age), Bronze Age, and Iron Age upward. Thus, with updated plant and equipment, and the financial backing of one of the largest construction companies in the country, the shovels were back digging out the sand and gravel from (Pit C). Eyeballs were back, eagerly scanning the new area! An attempt was made to set up a watching brief at the quarry, (someone to look for, and report on items of interest), but this failed to receive full approval at some official levels. The quarry operators nevertheless, were always helpful and welcoming toward any sort of inspection at any time, although many excursions were made to Lynford during evenings and weekends, just for the peace and quiet. It’s strange how difficult it becomes to see things clearly when there is a clatter going on! And what could be found on this eastern reject heap? – Some good flint again at last, with a familiar look to the patina, - half an old rolled mammoth tooth, - a fragile portion of reindeer antler, and a levallois core, (a unique method of flint knapping, used to produced a series of useful flakes). But no actual flakes! - And no handaxes! (Pit C) differed from previous excavations in that many high and dry chalk exposures were showing at a depth of less than twenty feet. Freshwater springs were common, and rarely did any dangerous quicksand accompany them. The new management adopted a technique of pumping out water at a faster rate than had been observed before, directly over a baulk and into (Pit A). This more effective drainage system meant that scavenging flint knappers, as well as crawler grabs and transporters were able to operate very close to the base of the gravels. So (Pit C) turned out to be watcher friendly, and some rather unusual features were revealed. Figure 9: Levallois core. Illustrated by J.Wymer. Figure 9: Found from (Pit C) rejects by the author. 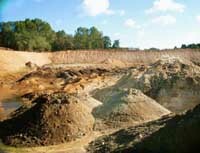 Two people visited Lynford quarry late one Friday afternoon in mid September 2001, and were amazed to see several conical piles of organic silt dumped in the base of the pit at the western edge. White, rolled, fragmented, and poking out from of one of the silt heaps was a piece of bone. This caused some temporary excitement due to its similarity in appearance to a human humerus, and an investigation was launched to find the source of the silt, which it was hoped might contain more artefacts. The organic channel is revealed in the baulk between pits A and C.
Part handaxe: found by Val Lord. Worked timber from northern section: Pit C.
The quarrying process at Lynford was fast and efficient, and the pit landscape was barely recognisable from one day to the next. Worked timbers were unearthed from gravel sealed channels that were positioned just below the flood plane deposits of the northern section. The pit manager stated that the organic material had been a nuisance factor to them, and that the lower channel had been a continuous feature running from east to west across the pit. The material from the lower channel had all been transferred to a dump in the pit centre, and on inspection, the dump was found to contain a high percentage of bone, tusk, antler, flint handaxes and some debitage. Much of this material is still in place and awaits inspection. On Sunday morning, 24th February 2002, a solitary figure could be seen rummaging around at the base of the quarry in search of a few small take-away nodules. The figure glanced up at the northeastern section, (shown above), and went over to inspect an area where the digger bucket had been tearing through a one metre deep organic deposit. Just below the bucket teeth marks, the section was displaying a quantity of small black flint fragments, and at a glance some of them looked remarkably like artefacts. None of these flints proved to be man made however, nevertheless, an organic layer containing gleaming black flints would be worth cleaning up for a photograph. A photograph of this cleaned up section was never taken! A trowel made contact with an object that issued deep reverberations. The trowel had touched on bone, a large bone. To avoid interment, (as there was several tonnes of loose gravel directly above a rather excited solitary figure), the bone was traced back, by some very careful tunnelling. Mammoth tooth: The first Lynford artefact in primary context. A sack full of shattered bone led to this remarkable find, a huge mammoth’s tooth, complete with root system, and incredibly well preserved. More frantic trowelling, a metre or so to the left of the tooth, revealed a fragmenting section of tusk that measured approximately twenty centimetres in diameter. Feeling both elated and stunned, a solitary figure staggered away from the Lynford quarry without any take-away nodules, but laden instead, with as much of a mammoth as one figure could carry. One week later, photographs of Lynford’s mammoth remains were being shown to schoolchildren in Scotland. Twelve days after that, two solitary figures were digging franticly at the Lynford quarry. Samples of mammoth were required for species identification, and there was no time to loose! The quarry operators were poised and waiting to remove the remaining organic waste. 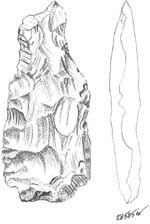 Handaxe: found by Nigel Larkin.Thinning flakes: found by the author. “Basically it’s like this”! The discovery of the four artefacts pictured above, in association with the mammoth in situ’, meant that the Lynford quarry instantaneously became the most unique site of it’s kind in the country, (Neanderthal activity in situ’), and heavy funding ensured that all of the remaining silt was scientifically examined by the Norfolk Archaeological Unit. The quarry proprietors were quite rightly given full credit for the discovery of the site, for if they had not dug this hole at Lynford, then not one solitary figure would have been able to look into it. Note by the author: (Pit C’s) archaeology was investigated during year 2002, and I now look forward it’s future publication: This examination revealed that the channel edges had been disturbed or removed by the turbulent deposition of later gravels, so any evidence relating to ‘on site tool manufacture’, would have been forced to join the gravel system. Is it just possible therefore, that some of those migratory artefacts might have already been retrieved from (Pit A’s) reject heaps during the past fifty years?